Well we are back in Robe for our regular Christmas holiday. We have had the odd BBQ, or 2…or 3… or 4…. Yep, there have been plenty of BBQs. 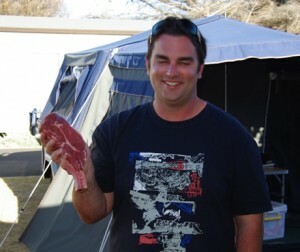 Kate bought Jason a 750g steak a few nights ago from the Robe butcher. It was awesome. It took Jason about an hour to cook it to his liking. Of course there has also been a heap of Crayfish eaten over the last week or so. This one weighed in at 2.2kg and tasted absolutely fantastic! 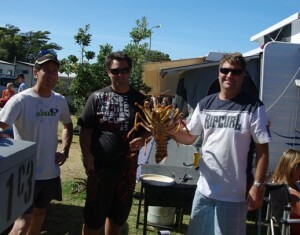 Weve caught about 11kg of cray so far(In 5 days). But we are almost out of stock now as the swell has got up to about 3 metres and we can’t get out to bring in the cray pots. We have had plenty of hot weather and spent most days on the beach. Since New Years day there have been far less people around. A few days ago there was a fire. 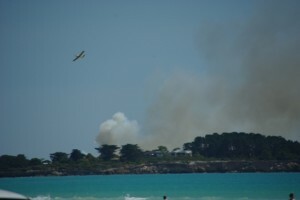 We could see it from the beach and it turned out to be over the road from Robe Motors. They used fire bombers to put the fire out. Locky hasn’t quite perfected beach parking yet! Seems to have a problem staying on top of the sand. 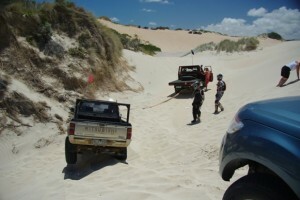 In fact, If Lockys wheeels are not burried, they seem to be in the air??? This was Locky stuck on the beach on the way back from Beachport. Had to pull him out of this one. We drove down in 10 cars and bought almost all the pies in town, then set off down the beach to drive back to Robe. Jason Had som fun chasing seagulls. 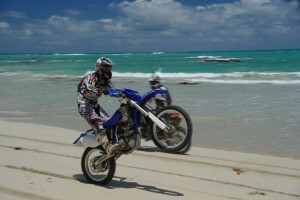 While Sam rode the beach on the YZ and spent most of his time either on the back wheel or in the air. Jason also got in on the ride. 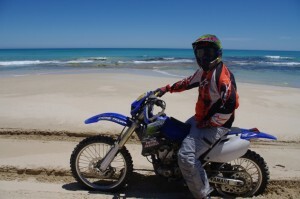 Of course we also had Knobby (Jack) tagging along in the “Red Baron” which needed a new gearbox a few days before the trip to Robe. 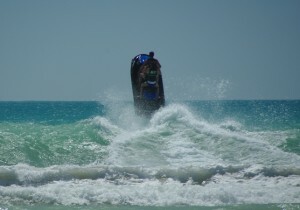 There has also been plenty of action on the Jetskis again with plenty of “air”. 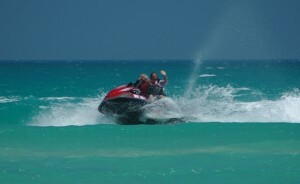 Even Mum got in on the act and had a ride. Well thats all I have time for at the moment. I’ll try and get back to do another update in a few days time.